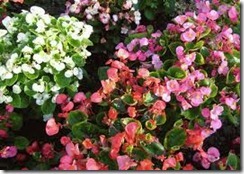 Begonias are annuals, or flowers that live only from spring until first frost. These are colorful, attractive flowers that blossom in a range of oranges, yellows and reds and have a reputation for being easy in the garden. Because begonias are short-term plants, many gardeners use them for container growing and as accents in the garden. Begonias grow from 8 inches to 2 feet tall, depending on variety and space, and can thrive in small pots or large barrels. To create your own colorful begonia barrel, purchase a used wine barrel or planting barrel from the nursery and get started. 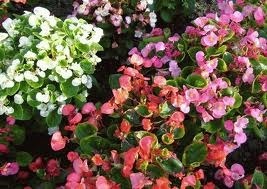 Start begonias in spring, when all sign of frost is past. Put the barrel in the right location before you fill it with soil, as it will be heavy and difficult to move when full. Find a site that gets partial sun and partial shade during long summer days. Although begonias need the light to produce their flowers, they may burn in too much intense light or heat. Mix quick-draining potting soil and organic compost in equal parts. Don’t use garden soil, as you may import pests and weeds. Don’t skimp on the organic matter, as begonias require soil that retains moisture and nourishes their roots. Fill the barrel with the planting mixture, to within 2 to 3 inches of its top. This will allow the begonias to grow up over the lip of the barrel and into the sun. Add 10-10-10 or organic fertilizer to the top inch of the soil the day before planting. Plant wax begonias in areas where summer temperatures stay above 70 degrees, and hardy begonias in cooler areas. Start begonias as tubers — bulbs — or seedlings. If you’re starting tubers, plant them just under the soil line with the depressed side facing up. If you’re starting seedlings, plant them in holes as deep and wide as their root balls. Give each begonia 8 to 12 inches of space in the barrel, and allow them to expand for a crowded environment. Water begonias with at least 2 inches of water every week to keep them consistently moist. In areas that receive frost in the winter, dig up begonia tubers at the end of summer. Store them through the winter, then plant them again in spring.